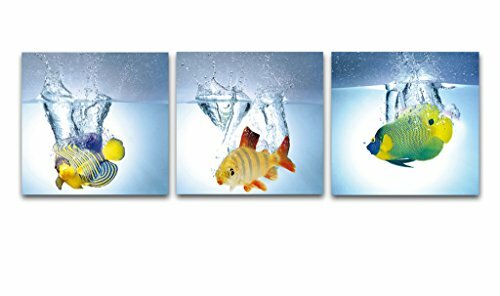 3 panels gallery wrapped pretty decorative blue animals canvas paintings wall art prints ready to hang for home decorations wall decor. Each panel has a black hook already mounted on the wooden bar for easy hanging out of box. Hot sale. A perfect wall decorations paintings for living room, bedroom, kitchen, office, Hotel, dining room, office, bathroom, bar etc.. Due to different brand of monitors, actual wall art colors may be slightly different from the product image.